Short bit of history- developer Renegade Kid had taken Dementium as a prototype to Konami intended as a Silent Hill game, but were turned down. They proceeded to turn it into their own IP, and released it on October 26, 2007. In most North American timezones, this review will be posting on the game's tenth anniversary, which is a really cool coincidence that I had not noticed when I decided that today would be the day I reviewed this game, which I knew that I was going to do at the onset of this series. In fact, it's one of the few games that I planned on reviewing beforehand, primarily because it's both a survival horror game and it's made by an indie developer. 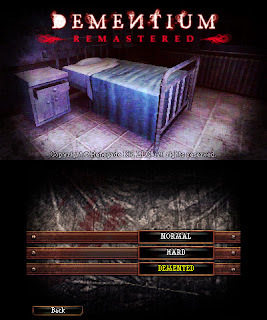 While now "defunct" (Renegade Kid has split into "Atooi" and "Infitizmo"- the latter of which owns the rights to Dementium), I still wanted to make sure that I featured such an innovative game originally made for the DS. It was revealed in 2014 via Twitter that Renegade Kid now had the rights to their game back from the original publisher, and proceeded to make a remastered version for 3DS, which is what I will be discussing here. 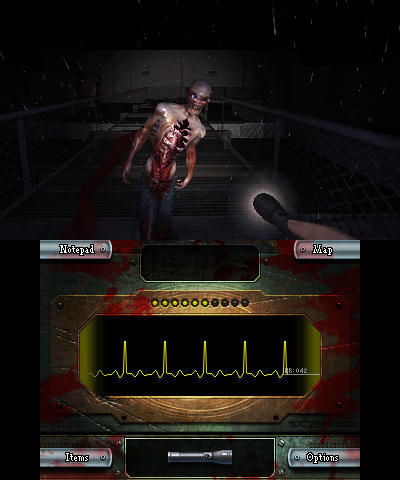 The remake polished up the graphics and added in an "ultra hard" Demented mode. I did not subject myself to the ultra hard mode, as I was having trouble navigating enemies as it was in easy. So, we have a first person game that begins with us being pushed in a wheelchair through a very bloody hospital, populated by monsters with exposed organs, and creepy children. We are then seemingly dumped down a hole into a bed...where we either have just landed, or just woken up from this nightmare hospital. We get up out of bed, and see a flashing item on the floor. We pick it up, and it is a notebook and a small key. The notebook's front page says "why did you do it?" and we learn that we can use the touchscreen and stylus to write in the notebook. This is actually a very useful, and very cool feature to have in the game. You will run across phrases and numbers scrawled on walls, and being able to write them down while fresh in your head helps to prevent you from needing to backtrack. Which is very important, because as is usually the case in survival horror games, your supplies are limited. Even worse? Enemies respawn in previously cleared areas. This works for and against the game - for it by always providing tension and a little bit of uncertainty (did this room that had medicine in it have an enemy or not? ), but against it for discouraging you from backtracking if you need to find a key that you overlooked the first time through. The takeaway here is that you should be as thorough as possible when first exploring any area, because it'll help you preserve health and ammo in the long run. When we exit our room, we hear an overhead announcement that this is an emergency, and everyone needs to head to the stairwells to evacuate. Soon after, you find a flashlight and this is your primary means of seeing where you are going and what awaits you. There are a few areas where the lightning outside will help light up the rooms, and a few times that you are outside where your visibility has improved, but it's basically the flashlight. Shortly thereafter you witness a nurse being drug down a hall and through a door (that locks behind itself) by a large monster. The flashlight and how it's utilized also helps create tension and unease, as you can either use the flashlight, or a weapon. You cannot use both at once, so you have to spot something with your flashlight first, and then cycle to your desired weapon to attack your enemy. The game has labyrinthine hallways filled with open and unlocked doors and closets. Exploring all of these does become a little tedious at times, but it isn't too big of a detriment until you feel like you've done it all before, and double check your map to make sure that you didn't get turned around and repeat an area. You will mostly be navigating the hallways(which can be checked on a map easily accessible through the touchscreen with a stylus), but get a few input puzzles here and there. 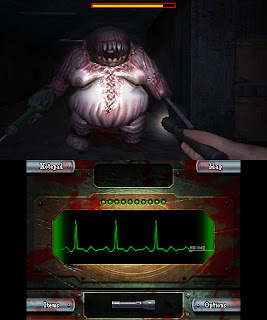 Combat is a little slow, but this is usually the case in the genre, and this game does an amazing job emulating the feel of mid-late nineties style horror games, and recreates them very well on the DS/3DS hardware. This is really where the game shines- as it isn't a very impressive title to have been released for PS3 or Xbox360 in 2007, but it is beyond it's years for a game made for a very under-powered handheld, and the remastered version looks decent on the 3DS, as well as how well implemented the 3D effect is on the remaster. Controls are actually pretty good, and might be better for some people using a "new" 3DS' nub or the circle pad pro, but I actually found that I preferred using "ABXY" to manipulate the camera over the nub. The circle pad (left stick) moves you, Left/Right cycle through weapons, L uses weapon, R uses items or activates dialog/doors, Up reloads, and the touchscreen pulls up inventory, map, and the aforementioned notepad. As I mentioned above about the respawning enemies, avoiding them on backtracks doesn't help when there are too many of the same enemy over and over, and the tedious hallway exploration do make the game feel less full. I told myself while playing that of course a large portion of the game is going to look and feel familiar- it's a hospital, and it's just how they're designed. I used to be a security guard, and I've walked through sections of abandoned hospitals before. There wasn't this much blood, but it is all very samey. It just feels like there could have been a little more variety? It does succeed in being creepy and very mysterious...but maybe too mysterious because most of what we learn about the game from the game is inference based on a few scattered notes and newspapers. Happy Birthdays is an updated version of Birthdays, the Beginning, which released last year for PS4 and PC. In Happy Birthdays, you take on the role of a god. You stumble into a cave and find a strange cube and a little voice asking you for your help with creating life on this cube world. This is a strange request, but how often do you get the opportunity to play god? Unfortunately, being a god isn't the most interesting thing in the many worlds, but it is oddly satisfying. Your primary objective is to take a newly birthed cube planet, and manipulate the weather, humidity, flora, and fauna using poorly explained controls and skills to foster the successful evolution of modern humans. You have a checklist of different species that you can choose to bring into reality beyond that, but they are completely optional. The initial tutorial doesn't do a great job of explaining how you play the game, but it also prompts you with relevant information as you play through the game. The Ys games have an unfortunate legacy of being overshadowed by the colossi of the roleplaying genre. Fortunately for them, however, they have always been solid entries into the genre, and ever since they found their true footing in the Playstation 2 era, have definitely been steamrolling in popularity. At least, steamrolling by JRPG standards. Each subsequent release has been warmly welcomed and praised, but the majority have been on handhelds the last two generations (most notably on the PSP and Vita). Milanoir is a seventies inspired mafia shooters that leans heavily on the sights, sounds, and tropes of the era. While rendered in pixels, the sprite based art conveys grimey seventies crime movie incredibly well. Does that atmosphere hold up with the gameplay?